Many businesses reach a point where generating quotes and proposals for customers becomes painstakingly long and inefficient. If spreadsheets and word documents are still used for product and pricing updates, it is clear that that the sales process could be running more efficiently. In many cases, business will opt in for a CRM software thinking it will solve all their problems, but CRM falls short in most vital areas of the sales process (i.e., such proposal and quote generation) and here is where CPQ can help. Although there has been a lot of buzz around CPQ lately, many businesses don't understand if its worth the investment. 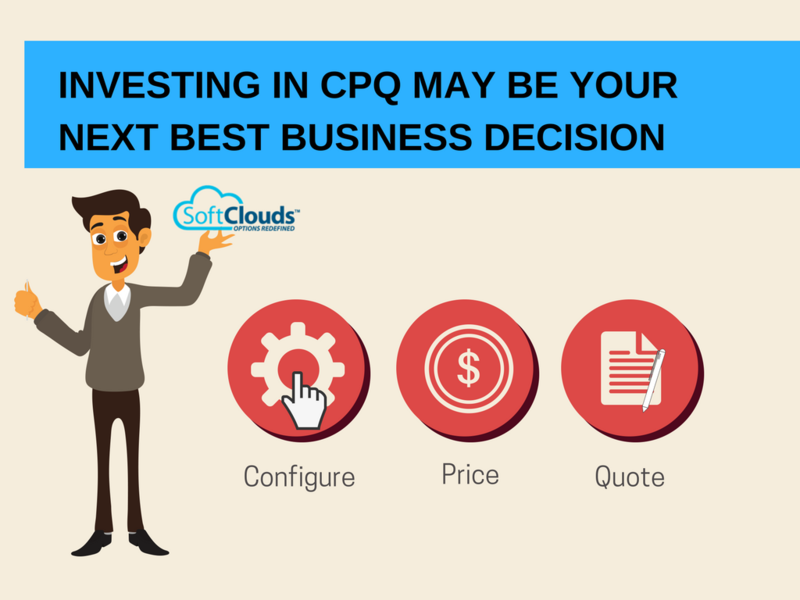 To address this, here are five reasons why investing in CPQ is a good idea. 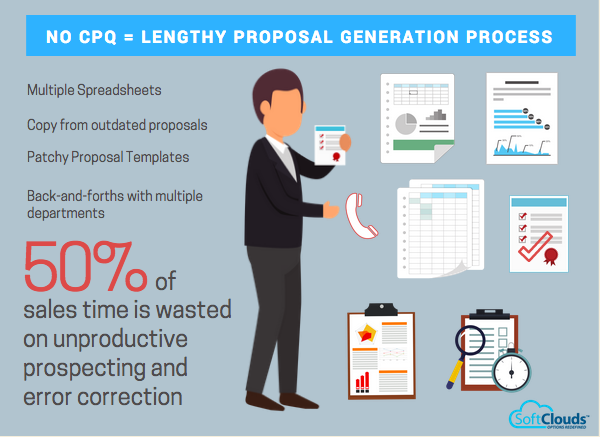 Without CPQ, proposal generation becomes more complicated. Sales reps have to do a lot of manual data input and are more likely to create inaccurate prices, discounts or promotions. Furthermore, without CPQ, generating a proposal takes much longer. 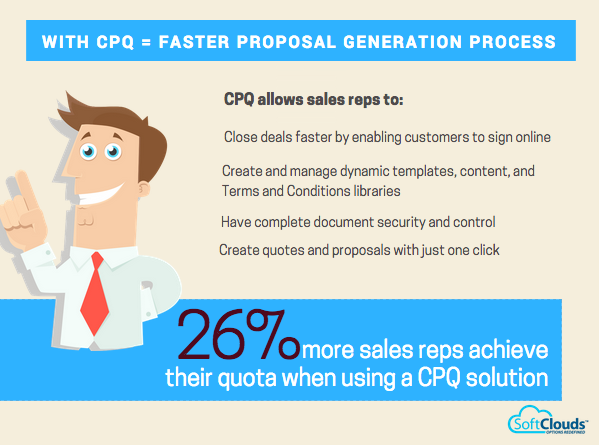 When not using CPQ, sales reps take 73% more time to produce a typical quote or proposal compared to a CPQ enabled sales rep. Hours turn to days or weeks of back-and-forth talks with pricing managers, leasing managers, and logistics teams to generate a final proposal. According to the Aberdeen's study, CPQ-enabled sales reps take 27 % less time (3.6hours) to produce a typical quote or proposal than those not using CPQ (4.9 hours). With CPQ it takes seconds for sales reps to generate accurate and professional proposals, statements of work, and legal contracts tailored for their branding needs. Giving you a better understanding of what customers need so that you can attract a buyer with a personalized offer at the right time. Allowing your sales reps to deliver fewer quote versions compared to other firms, keeps the selling process more straightforward for the buyer. CPQ simplifies the buying experience for your customers and makes it more likely that they will close the deal. The Aberdeen Group's research brief shows that CPQ software can increase quote productivity by 33%. Spreadsheets often lack real-time data, make version tracking difficult, and can become complex and difficult to manage and use as they often need to be updated or require rules and formulas. 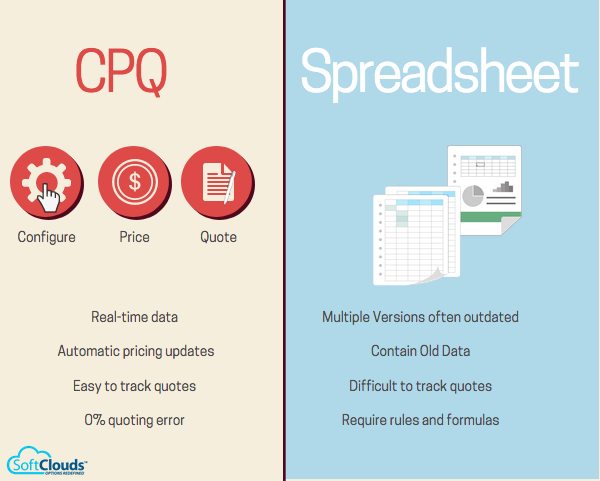 CPQ completely eliminates the need for spreadsheets from the time-consuming quoting process. CPQ can fully-automate quoting and easily track and manage quotes and allows users to access a common system. Edits are easily made and updated in real time, pricing is updated automatically so the chances of using an outdated price is unlikely, data access may be restricted, and there's no old version to access, therefore, mistakes with using an older file are impossible. 4. Invest in CPQ if you want to track marketing and sales trends. Tracking marketing and sales trends and identifying sales opportunities is difficult. CPQ assists by restructuring the pricing processes and understanding market conditions. This allows for price adjustments to be made appropriately as well as to generate sales or create contracts quickly. It can help to set current prices, project future product demand and pricing, as well as resource planning with detailed analytic capabilities. CPQ has a centralized data repository that stores customer information in one place. Not only does this make it easy for sales people to find information, but important customer data is always ready and up to date. According to Forrester's research, Oracle, Apttus, and CallidusCloud lead the way in CPQ solutions. However, competitive options are available from FPX, PROS, Salesforce, IBM, and SAP. In conclusion, businesses that want to keep up with today's fast-paced markets will greatly benefit from a CPQ solution. Reasons for investing in CPQ include its ability to aid with increasing sales deals, improving sales margins, shortening the length of the sales cycle, and improving customer satisfaction. In a nutshell, CPQ can help with the sales process — all while decreases the number of errors and giving sales reps more time to sell rather than spending their time with manual data entry or calculation. According to Cincom , those who use CPQ solutions outperform non-users by 105%, so if businesses want to outperform their competitors, investing in a CPQ solution should definitely be their next business decision. This post was written by Srikesh Menon — Senior Technical Architect & CPQ Practice Director at SoftClouds has 12+ years of experience with technical solution design and end to end implementations. Srikesh is also certified on Oracle BigMachines and Siebel. He specializes in developing CPQ processes, complex Configuration of Product Catalogs, Pricing, Tracking & Approvals, Order Management, Service Management, Partner Management and Loyalty Management modules.